Big data has grown to become one of the most lucrative fields. In fact, data scientists are some of the most sought people. They are usually hired to analyze, control and parse large chunks of data. Implementing these actions using traditional techniques is not a walk in the park. This is why most data scientists prefer using programming languages such as R and Python. However, there is one more programming language that can do the job. That is Julia programming language. Julia is a programming language that came into the limelight in 2012. It is a general-purpose programming language that was designed for solving scientific computations. Julia was meant to be an alternative to Python, R and other programming languages that were mainly used for manipulating data. This is because it has numerous features that can minimize the complexities of numerical computations. Julia optimizes on the best features of Python and R while at the same time overlooks their weaknesses. This explains why it is viewed as an alternative to these programming languages. For instance, it utilizes the readability and simplicity of Python then performs faster. Who is Julia Language For? 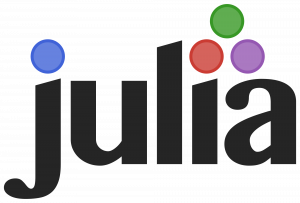 Julia is the most preferred programming language for data scientists and mathematicians. This is because its core features are similar to the ones that are used on most data software. Also, the language is ideal for these two subjects because its syntax is similar to the standard mathematical formulas. Another reason why Julia is preferred by data scientists is that it supports cloud computing and parallelism. Most big data projects rely on these technologies. If you are a data scientist or you intend to become one, consider learning Julia. Julia is only compiled and not interpreted. This is the main reason why it is faster than interpreted languages. JIT (Just-in-time) compilation makes Julia have the same speeds as C programming language. Although you can run Python and R codes in parallel, the process is a bit complex. Julia programming language makes things simpler. Its parallelism feature allows functions to run independently hence utilizing the full function of the CPU. Julia will allow you to type your strings of codes dynamically while at the same time gives you the full advantages that come with static typing. Dynamic typing allows you to declare a variable without stating its type. Just like the Python programming language, Julia has a simple and direct syntax that you can easily understand. It is possible to generate other Julia programs from one Julia program. While programming in Julia, you can easily access external libraries which are written in C programming language. Julia programming language also shares some data with Python. In Julia programming, the first element of an array is denoted by  instead of . This form of indexing is quite simple to handle especially when dealing with large data projects. Julia is faster than both Python and R. This is a very critical aspect that is given special attention in the big data programming. The high speed of Julia is because of JIT compilers. You will need to install external libraries on Python to achieve similar speed. Julia has a math-friendly syntax. The syntax of this programming language is similar to the mathematical formulas hence can be used to perform mathematical and scientific computations. This syntax makes it easier to learn than Python. Although both Python and R use parallelism, Julia uses a top-level parallelism. Julia allows the processor to perform to the optimum level than what Python and R can achieve. Julia programming language is more versatile than Python and R. It allows a programmer to move from different codes and functions with ease. The only area that Python and R are superior to Julia is in terms of community. Given that Julia is a new programming language, it has a small community as compared to others which have been around for years. In overall Julia programming language is a better alternative that you can use to handle Big data projects. Despite having a small community, it is one of those programming languages that you can easily learn. I like your effort to make our computer knowledge stronger. I’m sorry but right now that is just not true, R and Python still fight for that crown. I largely lost faith in the articles accuracy at this point. Otherwise good article that offers a technological alternative to R and Python for the treatment of big data. I’ll go see that language.